It’s that time of year when a lot of us are invited into school for parents’ evening. In theory this should be a straightforward matter. You go in, listen to what the teacher has to say about your beloved, ask questions and ideally leave feeling peachy. In reality, it rarely works this way. Firstly it’s a mass scramble to get the appointment that you want. Everything is done online now so you have to sit at the computer, fingers poised, waiting for the booking system to open. If you forget you’re basically screwed and will end up with the worst appointment slot ever, namely when the kids are normally having their meltdowns or when it’s impossible for you to sort out babysitting. Whatever the case, you’re screwed and you only have yourself to blame. Like me, you might even consider taking an early appointment, straight after school, so that you don’t have to go home, rush around, get a babysitter and then come out again. In theory this should work well. Think again. Unless you are lucky enough to be blessed with angelic children who will sit quietly in the corner reading books whilst you have your appointment (seriously, there are some kids that do this) then just DON’T DO IT. My two monsters spent the entire time running around the school hall shrieking with laughter playing tag. I barely heard a word of what the teacher said, got eyeballed by irritated parents and basically felt humiliated. So this time I tried the opposite approach and opted for the late appointment at 7pm, leaving the kids at home. To be honest, it felt like a night out. I loved leaving the house on my own, enjoyed catching up with friends in the school hall and had countless cups of tea without interruption. It was flipping brilliant. 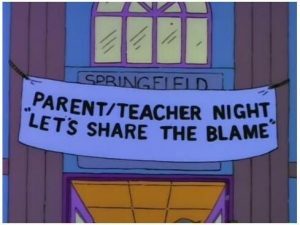 The only negative was that by this stage of the evening, the appointments were all running late (there’s always one overly keen parent who monopolises the teachers and asks a million questions), the teachers were knackered and there was no time for discussion. Oh well…who cares? At least I got a night out midweek. Woo hoo! The worst scenario for me would have been for the teachers to tell me that Flump was badly behaved. Asian family rule number 1: Never bring shame upon the family. Or that she wasn’t reaching her academic targets. Asian family rule number 2: You must always get good grades so that you can become a doctor, lawyer or engineer, even if you are only seven years of age. It doesn’t matter how anglicised or alternative you think you are, if you have a drop of Asian blood in you, these rules apply. Parents’ evening is like a rite of passage for parents. It’s all a bit nerve-racking the first few times, as we have no idea what to expect, but after a while it becomes easier. Then of course it gets worse again as the kids get older and have exams to pass. But until that horror kicks in, I’m going to make the most of my midweek night out…I might even organise dinner and drinks next time around! Who would have thought parents’ evening could be so much fun? Now I know what to expect some time in the future ! Great read. Loved the Asian rules! Lol. Don’t send your husband instead! Oh gawd Carmen, I hear you. Getting any information out of the Old Git would be near impossible. You might as well write off the evening! I thought that the ‘new/next gen’ Asian parents aims were: ‘Please don’t let my kid be the crappiest in the class’ instead ensure that Adam/Sophie/Zack etc were enrolled onto every extra cirrcular activity possible!! I think you may have a point too, Sani. There’s definitely a blog post coming about our obsession with extra curricular clubs..it’s nuts! Extra curriculum clubs please, waiting to read it. I normally turn out to pick her up and finger crossed it is the right place, right time and right girl that I pick up. They keep changing those clubs, not fair!